Rent a cocktail table for your Chicago suburbs event. These tables are sometimes referred to as: Cabaret table rental, cab table rental, low boy table rental, lowboy table rental, low-boy table rental. We have standard wood tables for use with linen tablecloths or specialty cocktail tables where no linen is needed. 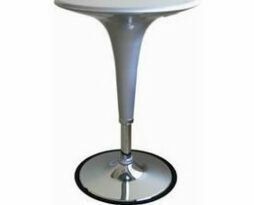 This brushed aluminum bistro highboy and cocktail bar pedestals table top is made out of aluminum. This cool yet retro table sets the mood for your guests in many types of environments. This table is versatile in function as it can be changed from a bar height table 42″ tall to a 30″ table with a simple lever. You can also set the table top in ANY height from 25″ inch tall to 42″ tall as the hydrolic base lifts and lowers to any height. This round cocktail bar pedestal table (also known as pub table, pedestal table, cabaret table) is a staple for rental on any Chicago special event. This table is versatile in function and can be used for just about any purpose. This table is common for use in wedding receptions, weddings, corporate parties, corporate meetings, corporate mixers, tradeshows, in tents, anniversaries, or any other purpose where having a place for people to gather is the intended result. 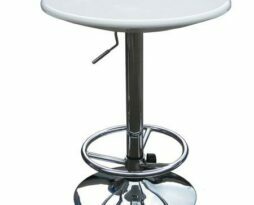 The dimensions on this round cocktail bar pedestal table rental for your Chicago special event are 30″ inches tall (standard dining height) with either a 30″ round top (cocktail table) or a 36″ round table top (cabaret table). 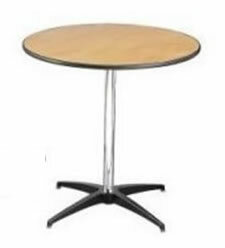 Common usage is with a 36″ round table top for the low dining height round pedestal table. 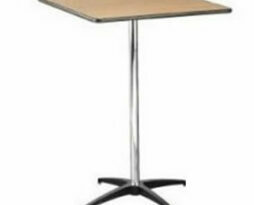 Many events use a specialty dining height chair with this table. See the Chairs section for all rentable options. This square cocktail cocktail pedestal table (also known as pub table, pedestal table, cabaret table) is a staple for rental on any Chicago special event. This table is versatile in function and can be used for just about any purpose. This table is common for use in wedding receptions, weddings, corporate parties, corporate meetings, corporate mixers, tradeshows, in tents, anniversaries, or any other purpose where having a place for people to gather is the intended result. 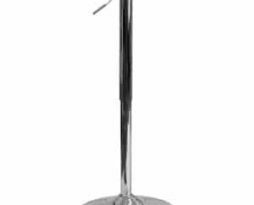 The dimensions on this square cocktail bar pedestal table rental for your Chicago special event are 30″ inches tall (standard dining height) with either a 30″ square top (cocktail table) or a 36″ square table top (cabaret table). 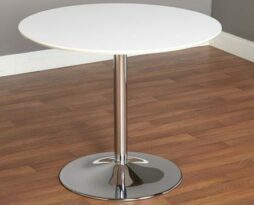 Common usage is with a 30″ round table top for the low dining height round pedestal table. 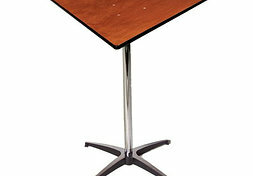 This triangle cocktail bar pedestal table (also known as pub table, pedestal table, cabaret table) is a staple for rental on any Chicago special event. This table is versatile in function and can be used for just about any purpose. This table is common for use in wedding receptions, weddings, corporate parties, corporate meetings, corporate mixers, tradeshows, in tents, anniversaries, or any other purpose where having a place for people to gather is the intended result. The dimensions on this square cocktail bar pedestal table rental for your Chicago special event are 30″ inches tall (standard dining height) with a 30″ three sided triangle top (cocktail table). Cherry red Café pub/cocktail table rental. Perfect for your Chicago special event, This ultra modern Adjustable Pub highboy cocktail table will add style and a place for guests to set their drinks. This ultra modern pub table can adjust between 33″ and 39″ with the lift of a handle. It features a swivel top with a chrome handle and base to accentuate the stylish design, and a cherry red top to add some pizzaz to any room. Café pub/cocktail table rental. Perfect for your Chicago special event, This ultra modern Adjustable Pub highboy cocktail table will add style and a place for guests to set their drinks. This ultra modern pub table can adjust between 33″ and 39″ with the lift of a handle. It features a swivel top with a chrome handle and base to accentuate the stylish design, and a clear modern glass top to add some clean looks to any room. White Café pub/cocktail table rental. Perfect for your Chicago special event, This ultra modern Adjustable Pub highboy cocktail table will add style and a place for guests to set their drinks. This ultra modern pub table can adjust between 33″ and 39″ with the lift of a handle. It features a swivel top with a chrome handle and base to accentuate the stylish design, and a white top to add some clean looks to any room. 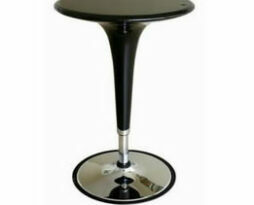 This “Scoops” black acrylic cocktail or highboy pedestal table (also known as pub table, pedestal table, cabaret table) is a cool rental on any Chicago special event where color is key. This table is versatile in function and can be used for just about any purpose. This black table is versatile in function as it can be changed from a bar height table of 35″ tall to a 25″ cocktail table with a simple maneuver. You can also set the table top in ANY height from 25″ inch tall to 35″ tall as the hydrolic base lifts and lowers to any height. The table width on this table is 23.5 inches. This black table is common for use in wedding receptions, weddings, corporate parties, corporate meetings, corporate mixers, tradeshows, in tents, anniversaries, or any other purpose where having a place for people to gather is the intended result. 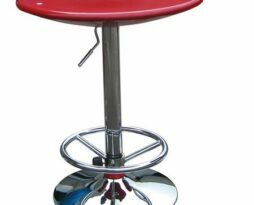 Many events use a specialty dining height or bar height chair with this table. See the Chairs section for all rentable options. We also carry matching Scoops chairs in many colors as well. 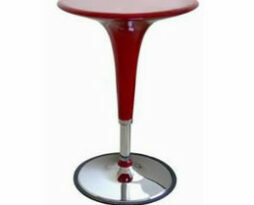 This “Scoops” red acrylic cocktail or highboy pedestal table (also known as pub table, pedestal table, cabaret table) is a cool rental on any Chicago special event where color is key. This table is versatile in function and can be used for just about any purpose. This table is versatile in function as it can be changed from a bar height table of 35″ tall to a 25″ cocktail table with a simple maneuver. You can also set the table top in ANY height from 25″ inch tall to 35″ tall as the hydrolic base lifts and lowers to any height. The table width on this table is 23.5 inches. This red table is common for use in wedding receptions, weddings, corporate parties, corporate meetings, corporate mixers, tradeshows, in tents, anniversaries, or any other purpose where having a place for people to gather is the intended result. 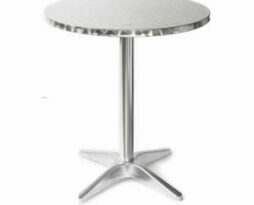 This “Scoops” silver acrylic cocktail or highboy pedestal table (also known as pub table, pedestal table, cabaret table) is a cool rental on any Chicago special event where color is key. This table is versatile in function and can be used for just about any purpose. This silver table is versatile in function as it can be changed from a bar height table of 35″ tall to a 25″ cocktail table with a simple maneuver. You can also set the table top in ANY height from 25″ inch tall to 35″ tall as the hydrolic base lifts and lowers to any height. The table width on this table is 23.5 inches. This silver table is common for use in wedding receptions, weddings, corporate parties, corporate meetings, corporate mixers, tradeshows, in tents, anniversaries, or any other purpose where having a place for people to gather is the intended result. Rent this outdoor table for your next special event. 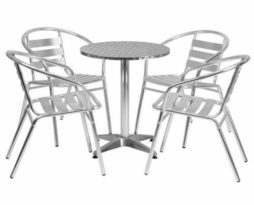 This lightweight aluminum table set is a modern clean looking set that is sure to upscale your event. Rent this white Club table for your next event! Any party is upgraded with this fantastic table that needs no cover. It has a white top with a chrome pedestal base. Its crisp white design is attractive, subtle and offers an air of elegance and simplicity. This metal base dining table features a chrome-plated base and MDF tabletop that's durable and attractive. It offers a retro vibe with a modern look. The round dining table's shape is just right for gatherings, creating a place to enjoy refreshments or conversations.